As I type this I am sitting in the backyard trying to soak up some rays while they last! Aren’t the colors on this card springy?! 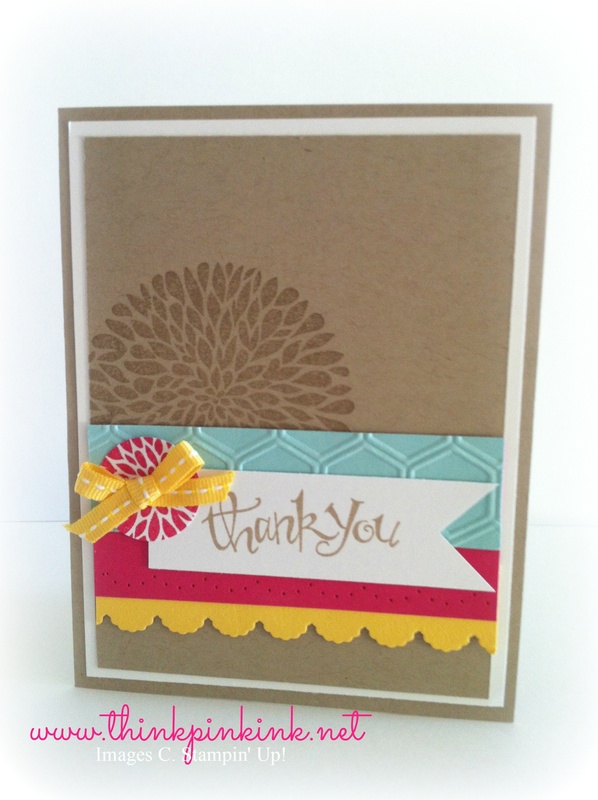 This is a CASE card that I just love.The original designer is Amanda Mertz (www.didyoustamptoday.blogspot.com). I just changed up some of the colors, sentiment, and ribbon. I kept with the Crumb Cake but used Daffodil Delight, Pool Party, and of course Melon Mambo! I used Sassy Salutations for the sentiment and popped it off with the Daffodil Delight Stitched Ribbon. Tagged Betsy's Blossoms, Daffodil Delight, Honeycomb Embossing Folder, melon mambo, one inch circle punch, Pool Party, Stampin' Up!